The fruit doves (genus Ptilinopus) are colorful, frugivorous (fruit-eating) doves that occur naturally in forests and woodlands in Southeast Asia and Oceania. This large genus contains about 50 species - some of which are threatened or already extinct. These small- to medium-sized doves generally have short, fan-shaped tails and a colorful, often glossy plumage. Males can usually be identified by their colorful, distinctive markings, which the females mosty lack. Most are found in and around the island of New Guinea, in the Philippines, and in the region of Wallacea. Some species have ranges as far west as the Sunda Islands, others north to Taiwan, south to Australia, and east into Polynesia. They live in various kinds of forest or woodland. Some are restricted to primary forest, such as lowland rainforest, montane forest or monsoon forest. Others favor secondary forest or disturbed areas. 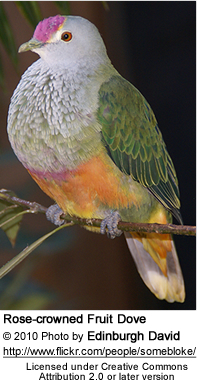 A few species are known to visit urban gardens and parks, specifically the Knob-billed Fruit Dove, Makatea Fruit Dove, and Black-naped Fruit Dove. 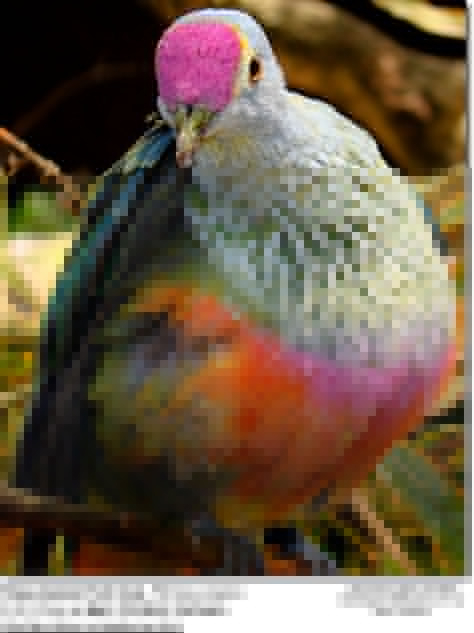 Fruit doves, as implied by the species name, mostly feed on fruits, for example the fruits of ficus plants are very important dietary components.